What Measures Should a Store Take to Prevent Slip and Fall Injuries? Store owners and managers in Miami have a responsibility to their patrons and employees to provide a safe shopping environment. Safe means free of hazards, which can and does include puddles, spills, and other tripping or slipping risks. Under Florida Statute 768.0755, a property owner or manager can be held liable for injuries sustained in a slip, trip, or fall accident if it can be provided that they had constructive knowledge of the hazard ahead of time. Constructive knowledge can be proved by showing that either a) the dangerous condition existed for a length of time that, in the exercise of ordinary care, the establishment should have been aware of the condition, or b) that the condition occurred with regularity, and therefore, was foreseeable. Unfortunately, despite conditions set forth in 768.0755, it can be difficult for slip, trip, and fall victims to win a personal injury case. The best way to achieve a desirable outcome to your claim is to work with a Miami slip and fall lawyer who is familiar with Florida law and who understands what evidence is necessary to support your claim. Though law dictates that retail stores, shopping malls, restaurants, super markets and other popular venues must do everything in their power to keep patrons safe, there is no precise law that tells them how to do that. It is left to the discretion of the business or property owner to implement policies and procedures for employees to follow. Additionally, most insurance companies require the insured to take certain safety precautions before they will grant them a policy, and they will review a company’s procedural guidelines periodically to ensure that they are keeping up with required safety measures. Moreover, most commercial policies cover slip and fall injuries, typically for up to $1 million dollars or more. That being said, it is not easy to win a slip and fall case. Obtaining a fair settlement, or even any at all, requires hard work, research, investigation, and the skill of a knowledgeable Miami slip and fall lawyer. 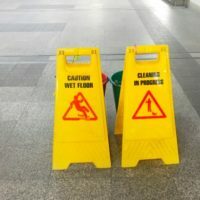 If you were injured in a slip and fall accident in a Miami retail location, and if you sustained serious injuries as a result, do not take any chances and reach out to a Miami slip and fall lawyer for legal assistance with your claim. Even if you believe that your case is cut and dry, personal injury claims are often complex, and unfortunately, do not often go the way the plaintiffs hoped they would. To ensure the most beneficial outcome to your case, reach out to a personal injury attorney as soon as you are able post accident. The sooner a knowledgeable lawyer can begin piecing together your case, the greater your chances of obtaining a fair settlement. To schedule a free consultation with an experienced legal team today, call Spencer Morgan Law at 305-423-3800 now.